A Tulsa pastor is facing a felony. Dr. Bobby Kendrick is accused of attacking a security guard with a folding chair outside of a high school football game. " I'm sure he's a nice guy. He became angry, and his anger led him to do what he did, which was a crime, said Tulsa Public Schools (TPS) Assistant Police Chief Dwight Jackson. TPS police say it all started when some of Doctor Bobby Kendrick's friends were denied access into the game. According to the police report the guard claims a younger and older man eventually left the stadium with the minister and a woman. Kendrick, the pastor at Greater Union Baptist Church at 955 East 36th Street North, says the woman is the secretary at the church. He says her son was supposed to play with Central High School's Alumni Band during third quarter, but he was late because he had to work. TPS does not allow people into the stadium after half time because of security concerns. Chief Jackson says the guard explained that, but the secretary's son and his father tried to get inside anyway. 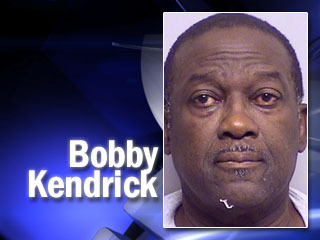 Kendrick say they were looking for the principal, and his secretary wanted the guard's name and badge number. He says that's when the guard tried to intimidate her. Kendrick says the guard even charged at him, and sprayed him with mace. Kendrick says he used his stadium chair to block the guard, but police say the guard suffered contusions to his face. "People should know or I'm sure he knows that when he does acts like that there are consequences. Regardless of who he is or where he came from," said Chief Jackson. Kendrick faces assault and battery with a dangerous weapon. He's out of jail on a $15,000 bond.